• Donald Trump has his story just a little bit mixed up about the “Arabs” he claims were celebrating after 9-11. Billionaire businessman and Republican presidential contender Donald J. Trump made international headlines when he told supporters at a political rally on November 21 that he saw “thousands” of Muslims in New Jersey celebrating the September 11, 2001 attacks on the World Trade Center. Reporters were quick to call Trump on his outlandish claim, saying that Trump’s eyewitness account was a figment of his own imagination. However, what was never discussed was who really celebrated on that day, according to multiple reports provided by AMERICAN FREE PRESS. In this lengthy article written by Michael Collins Piper for AFP’s special report on September 11, titled Debunking 9-11, the maverick author explains just who was videotaped high-fiving and cheering when the towers came down—and they were not Muslims. 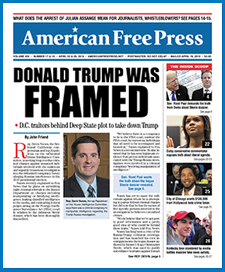 In its October 1, 2001 issue, which went to press on September 20, nine days after the 9-11 tragedy, AMERICAN FREE PRESS was the first national news source to make the connection between Israeli intelligence and the terrorist attacks. For doing so, AFP was accused of “peddling anti-Israel conspiracy theories.” But events prove AFP right. At the time, CBS anchor Dan Rather appeared on David Letterman’s “Late Show” immediately after the 9-11 attacks and said a “cell” of America-hating Arabs had been spotted across the river videotaping the World Trade Center (WTC) tragedy and celebrating on the roof of a building. Rather was dead wrong about the identity of those celebrating the tragedy. AFP revealed that the “Arab” celebrants were actually a group of Israelis and now, in its March 15 issue, America’s oldest and most prestigious Jewish newspaper, Forward, has confirmed that these Israelis were connected to Israel’s intelligence agency, the Mossad. What information about those five Israelis that did leak out into the media was consistently cited as “proof” that the Muslims were generating disinformation to discredit Israel. For example, the September 28-30 issue of USA Today cited the story of the five Israelis (calling them “Jews” and not identifying their nationality) and attempted to suggest that the story was a myth. Describing it as one of the “unsubstantiated rumors that implicate Israel” in the 9-11 attacks and one of which “many in the Muslim world are endlessly chewing over and recycling,” the so-called “rumor” turned out to be true. At least three different groups of Israelis—some of whom may have ties to Israel’s intelligence agency, the Mossad—were taken into custody after eyewitnesses reported seeing them celebrating in several locations across the river from lower Manhattan in New Jersey. In two cases, the men were reportedly videotaping the initial kamikaze attack on the World Trade Center in New York. All of the detained Israelis are connected to Israeli-owned moving companies operating out of New York and New Jersey. One group was reported to have been in Liberty State Park in Jersey City, another was seen in Liberty Park in Union City, and a third was apprehended on the roof of an Israeli-owned moving company. Citing reports in New Jersey and New York newspapers, AFP pointed out that two groups of Israelis were stopped in vans belonging to a New Jersey-based moving company, Urban Moving Systems (UMS)—one group of three and one group of five. While there has been much hubbub about what really happened on 9-11, and whether or not foreign intelligence services had advance knowledge, amazingly, AMERICAN FREE PRESS is the only news outlet in the world who sought out and interviewed Sgt. Scott DeCarlo, the man who actually busted the so-called “Dancing Israelis”—a group of foreign nationals caught filming the World Trade Center Towers from an adjacent building while dancing and laughing. Eyewitnesses had told police of seeing these Israelis in Union City and Jersey City, both of which have parks named “Liberty”—more than five miles apart. The third group was spotted on the roof of UMS itself, which is based in Weehawken, New Jersey, and from which there is a dead-on view of the site of the WTC. A New York Fire Department source told AFP that each of the three sites would provide a unique photographic perspective of the WTC disaster, suggesting the Israeli agents were working on a photographic record of the WTC tragedy. The five suspects who have been officially listed are brothers Sivan and Paul Kurzberg, Oded Ellner, Omer Marmari and Yaon Shmuel. The others remain unidentified and were perhaps never arrested after being stopped by police. According to an “Israel National News” report on October 26, the Israeli detainees were suspected of “plotting to blow up” a New York bridge, although this allegation never reached most Americans who were being told of “Muslim plots” against Americans. AFP pointed out that on September 18, the mother of one of the detainees told an Israeli newspaper, Ha’aretz, that the Federal Bureau of Investigation (FBI) had questioned her son as to whether he was an agent of Israel’s intelligence agency, the Mossad. Why the FBI would suspect that Mossad agents may have been involved in the so-called “Arab terrorist” attack is a question ignored by the mainstream media. Israeli-connected moving companies seem to proliferate in the events surrounding the 9-11 tragedies. It was not only in the New York-New Jersey area that Israelis working for Israeli-owned moving companies were taken into custody and suspected of involvement in possible terrorist-related activities. On October 17, the Pulitzer Prize-winning Pottstown, Pennsylvania Mercury reported that “two men whom police described as Middle Eastern” were detained in the Pottstown area (which is just northwest of Philadelphia) after being found with “detailed video footage of the Sears Tower in Chicago”—the tallest building in the world, widely mentioned as a possible terrorist target. The Mercury did not identify the men’s nationality, but their names were Moshe Elmakias and Ron Katar. “Moshe” is a Hebrew name which is not likely to have been bestowed on a Muslim or an Arab. A woman named Ayelet Reisler, in their company, was also detained. She had a German passport in her name and medication in a different name. AFP has since learned that there is a connecting network of Israeli-owned moving companies alongside UMS and Moving Systems, Inc. that have operated under such names as Advance Moving System, AAA Van Lines, State to State Van Lines, America’s Best Movers and Quality Moving Storage. Another connected “moving company” is Moshe’s, which maintains a huge brick warehouse just outside the Holland Tunnel in Jersey City, with a clear view of what was once the WTC. The 15-story building—solid brick with no windows—employs hundreds of young Israelis. Attorney General John Ashcroft has released an Israeli suspect in the September 11 terrorist events who “had trouble” with a seven-hour polygraph test administered by the FBI—but who “did better on a second try.” The suspect still flunked both times. That remarkable admission appeared in the November 21 issue of The New York Times. In fact, the Times reported, the suspect, Paul Kurzberg “refused on principle to divulge much about his role in the Israeli army or subsequently working for people who may have had ties to Israeli intelligence.” Yet, Ashcroft sent Kurzberg home to Israel. The Forward, a Jewish newspaper, reported on November 23 that “top-ranking Israeli diplomats” had intervened with Ashcroft on behalf of Kurzberg and four other young Israelis—evidently all former members of the Israeli army—who had been taken into custody by the FBI in New Jersey after being seen acting suspiciously in the aftermath of the World Trade Center attack. But there’s much more to the story than just these suspects. On November 23, The Washington Post admitted that among a total of some 60 young Israeli Jews picked up by the FBI in the wake of the terrorist attacks, there were at least a handful actually being held on suspicion of involvement in the terrorist acts. In several cases, such as those in Cleveland and St. Louis, INS officials testified in court hearings that they were “of special interest to the government,” a term that federal agents have used in many of the hundreds of cases involving mostly Muslim Arab men who have been detained around the country since the terrorist attacks. Now, as a consequence of the new admissions by Forward, we are learning much more about the one specific group of five Israelis connected to Weehawken-based UMS, who were picked up in New Jersey. However, a counterintelligence investigation by the FBI concluded that at least two of them were Mossad operatives, according to the former American official, who said he was regularly briefed on the investigation by two separate law enforcement officials. Forward reported that its source said that after the United States confronted the Israeli government, Israel privately admitted that the UMS operation was a Mossad front. If it’s the second scenario it would be more like the Russian Revolution which factions fighting each other and no central core to bring a resolution. Everyone will be fighting for their own *thing* that’s like a sleeper cell terrorist. The good news about Trump is that when he betrays the working class even more a lot more will come out with guns fighting in the streets. It could go really fast like 1776 the shot heard around the world which we become a beacon for freedom or it could be a long bloody battle before we reach an awakening with lots of dead families and law enforcement agencies who violate their oath to protect and serve. Unfortunately I foresee the second solution but it needs to happen. Hoax of 9-11 will haunt USA until the truth sees light of day! Muslims were also dancing but this was a different incident—with an arrest of a van full of lying Israeli agents carrying fake student IDs, tickets for immediate travel to destination around the world and almost $5k stashed in a sock; they were arrested after being seen atop their van on a parking complex roof “documenting” the attacks and celebrating. Muslims were dancing, that has been proven, and on blogs I read from all areas same, but don’t doubt this at all. I wonder if he’s a shill for the Rothschilds. Nothing makes sense. Not exactly, the SOB and puppet of the Zionist fake Jewish Oligarchs knows exactly what he is saying. WTC towers were brought down by NUCLEAR DEMOLITION. Check DIMITRI KHALEZOV. Unfortunately, Donald Trump is probably Illuminati. When the Rothschilds were trying to distance themselves from Jewish mafia man, Meyer Lansky, after founding Havana’s casinos with him, it was Trump who bought out Lansky’s interests and became partners with the Rothschilds. This might mean that Trump was inducted into the Illuminati many, many years ago. If he is, then it will not be possible for him to identify the 911 celebrants as Israelis, which is why he has so flippantly called them Arabs. I certainly hope that an investigative journalist will soon reveal if Trump has ever attended the Illuminati’s meetings or rituals, but looking back to his Havana casino history, I’d say yes.